Certain images and certain regions of language have a conflicted relation with pure and serene contemplation, demanding an intense activity of decodification, decipherment and translation. Images and linguistic signs, masked as road signs, which João Louro (b. 1963) has come to propose over the past few years in his work, are inscribed within a logic that searches for the meaning and a place for the excess of images that continually emerge and surround us. In the series of paintings, generically entitled “Blind Images” or in his “Dead End’s” road signs, Louro does not propose any sort of narrative. In the first case, glossiness reigns, as if dealing with a mirror. These monochromatic paintings are only interrupted by the appearance of a subtitle and the territorial delimitation operated by the frame. 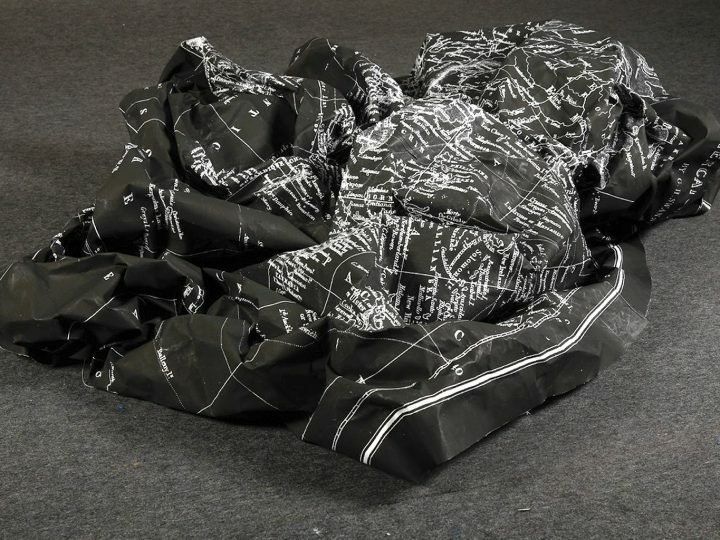 In the second, the metallic sheets that normally signal the localities a driver perceives along a journey become inhabited by poetry, philosophy and the very mystery of language itself. The end result can be compared to a map that is always incomplete and temporary: the localities it indicates are always transitory and are never adopted as final destinations. Paths multiply as the driver, which we take to be the artist himself, becomes the journey itself, and the maps he weaves are those of his own interiority. We can almost venture to say that we are on a journey made of multiple stops, but none is definitive. One of João Louro’s previous exhibitions, entitled “Blind Runner”, ironically implies the paradox of someone who, without seeing, runs incessantly, travelling without ever stopping. The inevitable question to arise is how can blindness be a method for the construction of images. In his “Blind Images”, João Louro departs from a real image, taken from a magazine or film (normally situations that are a part of humanity’s imagetic heritage, whether social, filmic or artistic) to hide the characters and forms: the images he collects are erased, leaving a lone subtitle, descriptive words that supposedly make the image clearer and more precise, in other words, that decode it. If, on the one hand, we are dealing with a contribution to the ever-growing archive of humanity and the urge to save what ought to be remembered from oblivion, on the other, this gesture renders the iconographic and representative nature of images that weave our collective imagination blind. There lies no thesis here as to what an image is, but the artist knows which different ingredients are used and it is of their activity that this awareness is born. 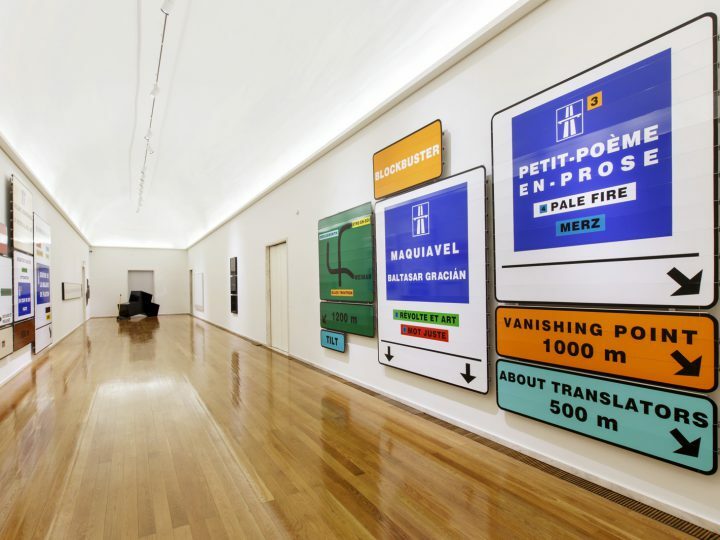 In one of his road signs, the image is adopted as fact and pact, a perception that is only attained as we confront images that do not represent anything, that have nothing to say, but where we continue to experience a meaning. This transformation obliges the subject – transformed into a spectator of phantoms and spectral entities – to look for himself: he shapes the images, he gives them meaning, he completes the experience. In these white or black canvases (one should not forget that for João Louro, Blind Images are photographs transformed into paintings), the artist’s concern with surface – a feature of the history of painting throughout time – never disappears and in some situations, one even senses his brushwork, where minimalist perfection becomes a poetics of the unfinished. 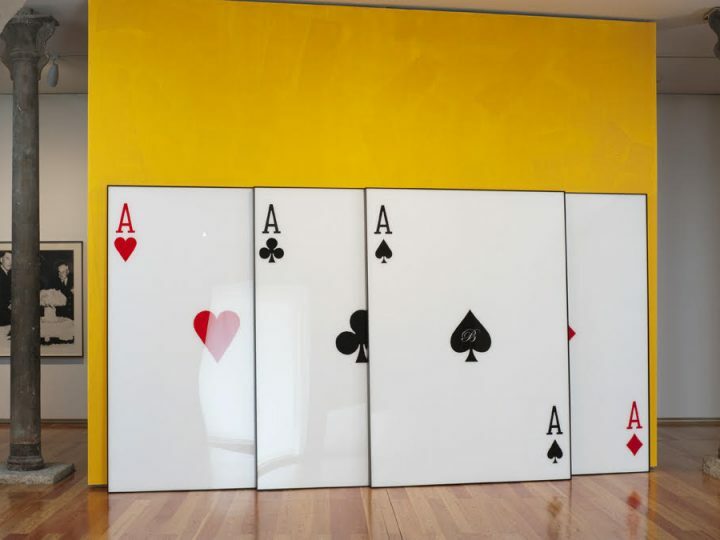 But the plexiglas that covers the surface stops the plunge and operates a kind of removal: the frame, an integral part of the artist’s objects, constructs a minimal volume of sorts. But once again, the paradox announces itself, because the distance imposed by the reflections foregrounds the viewer’s body and the place he occupies: all of a sudden, we see ourselves become the prime subject of these works. Uniquely confronted with spectres that suggest scenes and events that involve the viewer, the subject becomes a kind of translator and interpreter. Because the void in these images is juxtaposed with a caption and it is the viewer, abandoned and lost on these surfaces, that has to solve the enigma that is the relationship between the description given by the caption and an image we cannot see. The caption, which at a first glance seems to unveil the secret behind this sleek surface thickens the plot and makes viewing these works a challenge to translation and comprehension. We are always left without knowing what the relation is between the caption and the supposedly real image, which the artist has elided, and the colour field. This minimal measure of narrative and information that language introduces is bait, which draws us to confirm the possibility of reality or illusion. Only the artist, as the formative instance and engenderer of meaning, possesses the key to decoding and unveiling the reality of what we think we see. This play with language and images is transformed, in the case of João Louro, into a unique investigation into the status of this link, which is always presupposed and problematic, between what is spoken or written and what is seen. This artist’s work can also be appreciated as an exhortation of what each of us sees on our own as what, at a first glance seems so very simple: an image. This simplicity is merely apparent, for one immediately realizes that the construction of the image – that depicts, represents, presents, symbolizes – is more of a decision and an accord with certain features of reality. The virtually aesthetic and exclusively poetic gesture reveals itself as political by attributing sense and meaning to the elements that compose the visible layer of the world. With language, the exact same thing happens. This is why the use/manipulation of language is another permanent feature to João Louro’s work. His works are continuous movements of discovery of the symbolic and metaphorical potential of language itself and the images that words themselves form. The tension we detect here has to do with taking meaning to the limit and creating situations where words no longer have meaning and he who reads, who searches out information/directions/perceptions in words becomes lost. This is a game with silence and incompletion: images that are not finished, sentences that are not completed, beings captured in moments of indecision between appearance and disappearance, etc. These intervals – between the said and the unsaid, the visible and the invisible – constitute the quintessential place of João Louro and it is this space “between”, a kind of productive interval, where he establishes his artistic practice. 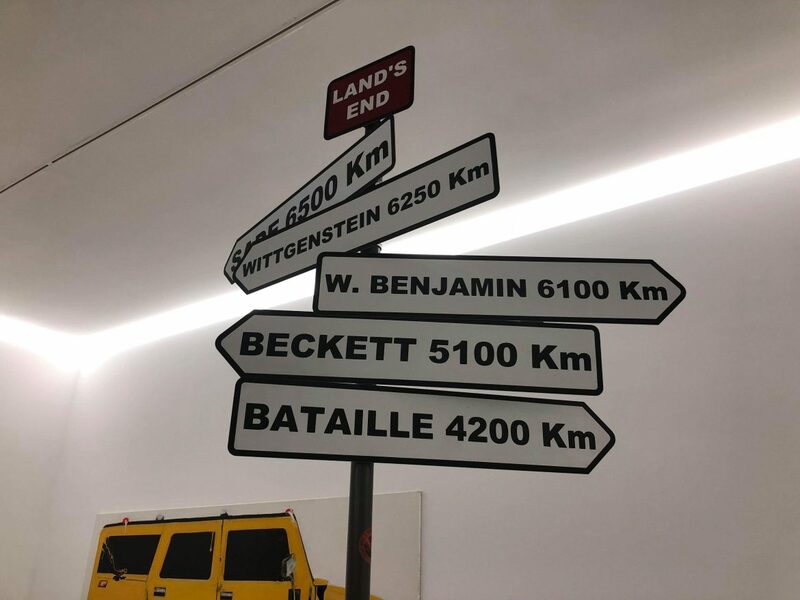 More than conceptual, his work is about suspicion – it is no chance event that the authors he refers to in his road signs are the masters of suspicion and doubt: Wittgenstein, Karl Kraus, Nietzsche, among others. References that do not redirect one to a universe of erudition, but are a kind of permanent cartography of images and collective constructs. This is the reason why João Louro’s images are dense locations where the skin becomes thicker and difficult to penetrate, and meaning more complex. All of João Louro’s works are steeped in a central intuition that the visible – in image, language, form and colour – always detains more than what we are able to suspect. This is not a psychoanalytical or structuralist mechanism that seeks the structure of a structure or the meaning of meaning, but a procedure that saves appearances from the reign of indifference and insignificance.